Winter swells are rolling into Diamond Beach. But surfer girls Fran, Pink, Marlee and Tilly are still consumed by all things surfing. Fran and Pink are collaborating on a surf label, and there’s news of a major surfing contest at treacherous Shipwreck Beach — a chance for Marlee and Tilly to dazzle on the world stage. But parents and boyfriends are distracting the girls from their big plans. Pink’s mother Christie is determined to control her spirited daughter; Marlee tells Kyle she has to concentrate on her surfing; and Jamie still can’t see that Tilly is anything more than just a friend. One thing that I really liked about Surf Sisters was that we finally got to find out a bit more about Fran and Pink, who play relatively minor roles compared to Marlee and Tilly in Surf School, but whose characters are really expanded on here, especially Pink. Though Pink seems at first very spoilt (and in Surf School, quite naïve), we find out a lot more about her in this book, and she becomes a lot more relatable and easier to empathise with. There were a great deal of subplots and things going on, and I felt a few of them didn’t have enough time to develop, or resolved too quickly. 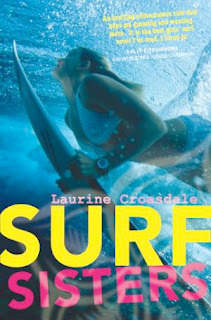 Other than that, this was a fun, fabulous novel, which really made you empathise with the girls and their plights – Pink’s to be taken seriously by her mother, Marlee’s to earn enough money to make it to the surfing competition – and felt terrible when they struggled with their relationships with family, boys, and each other. I think I liked Surf Sisters even more than Surf School (which I also enjoyed immensely), and I’d recommend it to teenage girls of all ages as an easy, fun read, and a must for girls who surf.